19-24 Feb 2018. 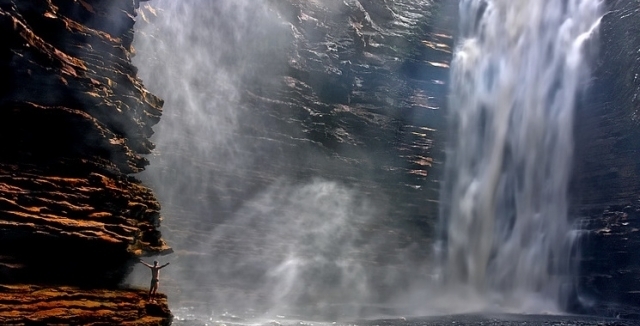 This trek through the heart of the Chapada Diamantina National Park takes you first to the remote Vale do Pati also hides its natural treasures away from the world. 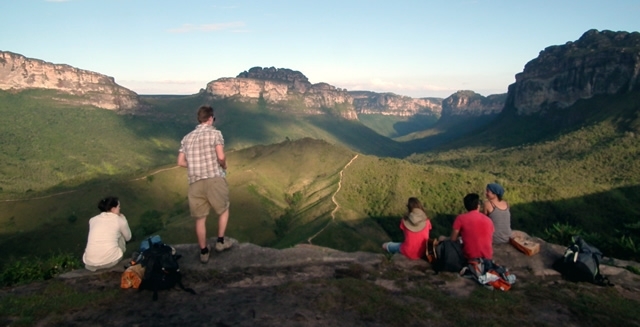 You have two full days of hiking to waterfalls and caves, while staying with a local family. The final sights include the impressive Buracao Falls, the postcard Poço Azul and sunset from Morro do Pai Inacio to finish! The hiking begins from the Vale do Capao on the morning of Monday 19 February 2018 and finishes in Lençois after sunset on Saturday 24 February. 19 Feb 2018. 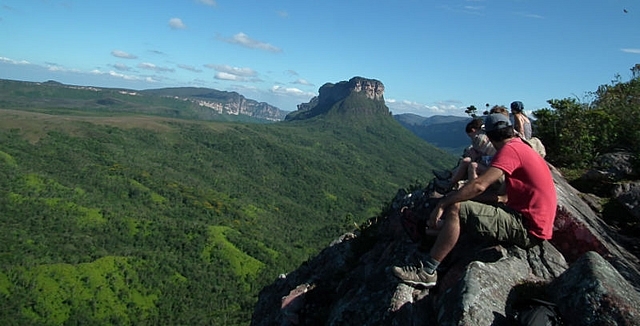 Your Chapada Diamantina Trek beings from the Vale do Capao with a hike of 22km along the trail out of the valley. Climbing up the Bomba trail, you reach the head of the valley with stunning views all the way down the Vale do Capao, and verdant chapadas stretching up on either side. After traversing the high meadows of the Gerais do Vieira and the Rio Preto, a stop for lunch high on the escarpment gives a wonderful view of the Serra da Lapinha in the middle of the valley and down into the Vale do Pati below it. After dropping back down to the head of the Pati Valley, you spend the night in simple local accommodation with a warm welcome and warm regional food. 20 Feb 2018. After breakfast, a 12km day of hiking the old trails of the remote and enclosed Vale do Pati begins. The first trail follows the riverbed of the Rio Funis, passing various cascades until you reach the waterfall of the same name. Cachoeira dos Funis provides another stop for lunch and a swim in the pools. The trail continues up to the top of the Serra da Lapinha, where you will find the Gruta do Castelo (Cave of the Castle), a huge quartzite cave. The cave passes right through the mountain to the other side, giving views of both sides of the Pati Valley, although never at the same time! After time for photos from way above the valley, you return to the bottom. 21 Feb 2018. As if the scenery around the Vale do Pati wasn\\\'t already fantastic, today\\\'s 15km takes you to perhaps the most scenic point in the valley and of the trek. Perhaps... Cachoeirao is the big waterfall, with a drop of around 300m in up to 20 falls in the wet season of April and May. The best view of these falls is from the opposite side of Pati, from a rock ledge that looks down on the falls and down, down to the bottom of the valley directly below. 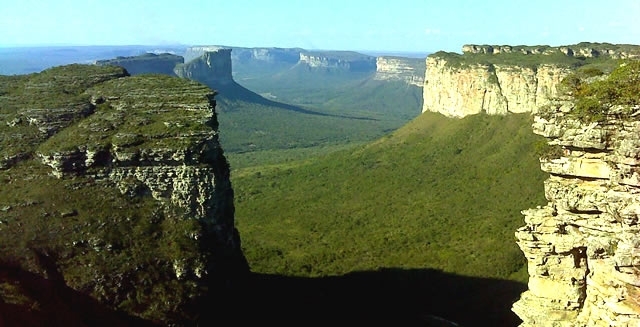 This vertigo-inducing view is one of the best in the whole Chapada Diamantina National Park, and your photos from here are likely to be amongst your very favourites of Brazil or anywhere else. The day finishes down in the valley . 22 Feb 2018. The day begins with the climb out of the far end of the Vale do Pati, the steep path that leads out of the valley and over the top to the village of Andarai. 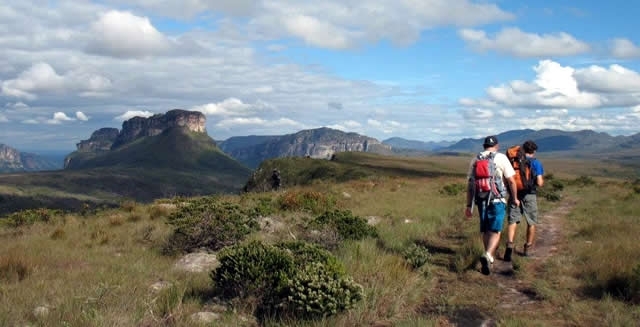 Another of the old pack-horse trails that criss-cross the hills of Chapada Diamantina, you have 13km in total, with the first section likely to take most of the morning, and the steady downhill to the village just a couple of afternoon hours. Andarai is one of the quieter villages in the park, and a simple dinner will be you reward for having made it this far! The night will be dark although not quite as dark as in the Pati Valley. 23 Feb 2018. 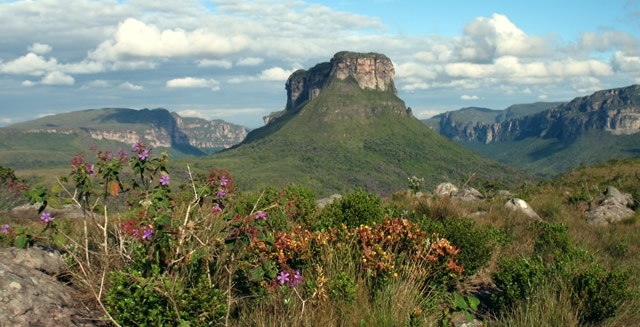 Every day in the Chapada Diamantina National Park is special. This day is even more special then most, with a visit to Buracao, a waterfall that seems to disappear into a big hole in the earth. The adventurous journey to it begins with the drive to Ibicoara and a hike along the banks of the Rio Espalhado, past Orquideas Falls. A descent takes you into the narrow canyon formed by the Buracao waters, with a short swim in lifejackets or a walk along the rocks to the large opening at the bottom of the falls. After taking some stunning photos at the bottom, you ascend the trail out of the canyon to enjoy the views and lunch at the top of the falls. You return by the same trail to your vehicle and then to Mucuge. 24 Feb 2018. 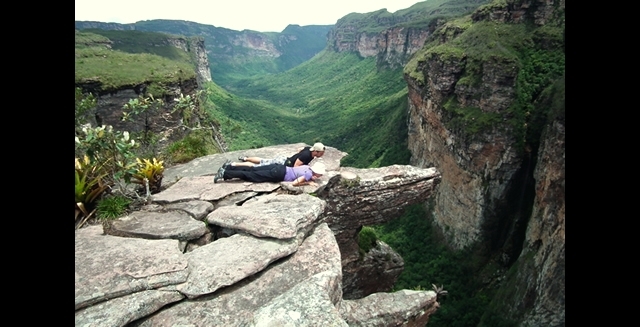 The final day of your trek and tour around the Chapada Diamantina National Park takes you to one of the postcard sights. Before then, a look around Igatu takes you to the ghost town houses abandoned by diamond miners. 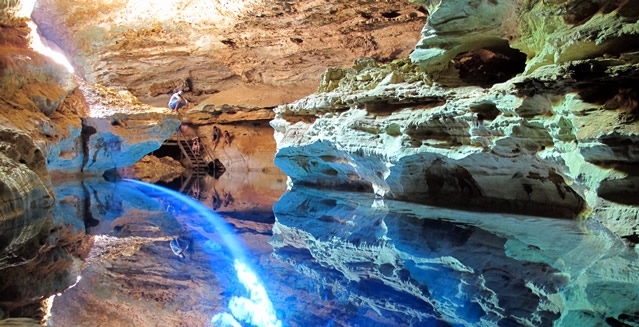 After a short drive, Poço Azul is the blue pool with more crystal clear cave water illuminted and turned blue by daylight. You can swim in the waters of the pool and watch your body turn blue in the light. 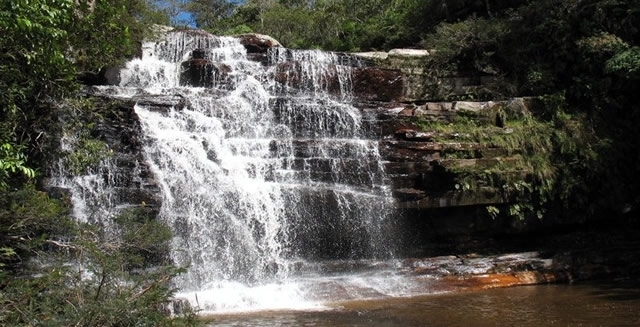 After lunch you continue north to visit the wild waters of the Poço do Diabo, before making the final stop of your time in Chapada Diamantina at the top of Morro do Pai Inacio, with wonderful summit views as the sun sets.